MINA, Maria. Social Complexity and Gender Inequality in Prepalatial Crete : An Argument of Reason or a Reason for Argument? 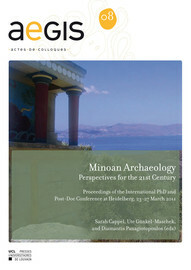 In : Minoan Archaeology : Perspectives for the 21st Century [en ligne]. Louvain-la-Neuve : Presses universitaires de Louvain, 2015 (généré le 24 avril 2019). Disponible sur Internet : <http://books.openedition.org/pucl/3042>. ISBN : 9782875585394. Mina, Maria. “Social Complexity and Gender Inequality in Prepalatial Crete : An Argument of Reason or a Reason for Argument?”. Cappel, Sarah, et al.. Minoan Archaeology : Perspectives for the 21st Century. Louvain-la-Neuve : Presses universitaires de Louvain, 2015. (pp. 181-198) Web. <http://books.openedition.org/pucl/3042>.